As much as we love it when an NBA player showcases his sensational physical abilities by stuffing the ball through the rim with complete reckless abandon, we find ourselves even more impressed when this play occurs at the back end of an equally impressive buildup. After all, sometimes it’s the sequence of events leading up to a particular moment that actually helps elevate it to another level altogether. We understand that most look at the art of dunking as an individual endeavor. One person, one ball, one overwhelming expression of authority. This is a single job, for a single person, and that’s how it ends up reading on the score sheet. But we think that viewpoint is too simplistic. There are some dunks — some epic dunks — that would not happen if not for a beautiful display of teamwork. The way we see it, this example happens to be one of those times. Everyone knows that when the Oklahoma City Thunder are at full strength they are one of the most elite teams in the National Basketball Association. In order for that to be the case, this organization needs both Kevin Durant and Russell Westbrook on the floor at the same time. That’s when the real magic happens. 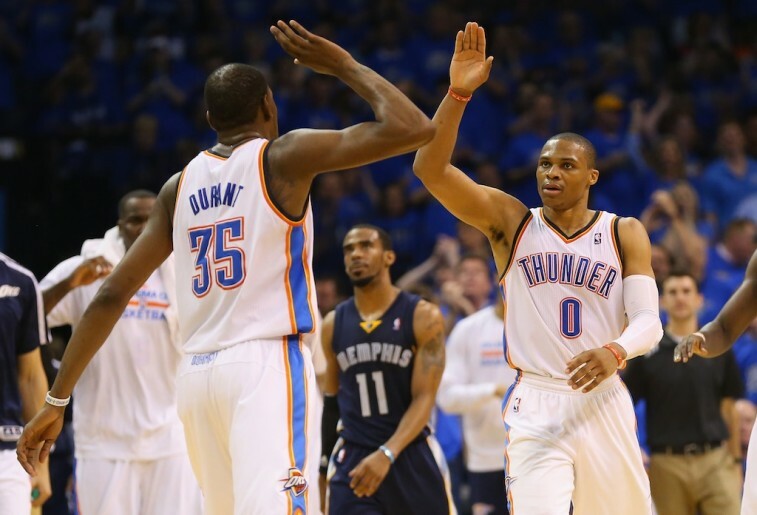 The 2011-12 NBA season proved to be a major turning point for the Thunder organization. Not only was this the year OKC would make it all the way to the NBA Finals — ultimately losing to LeBron James and the Miami Heat — it was also the last season that James Harden dressed in a Thunder uniform. Who would’ve guessed that so much change was about to come? When we think back to this Thunder team, we think about how special the group was. We think about how the players would continuously amaze spectators with their youth, energy, bounce, and penchant for getting the crowd on its feet. 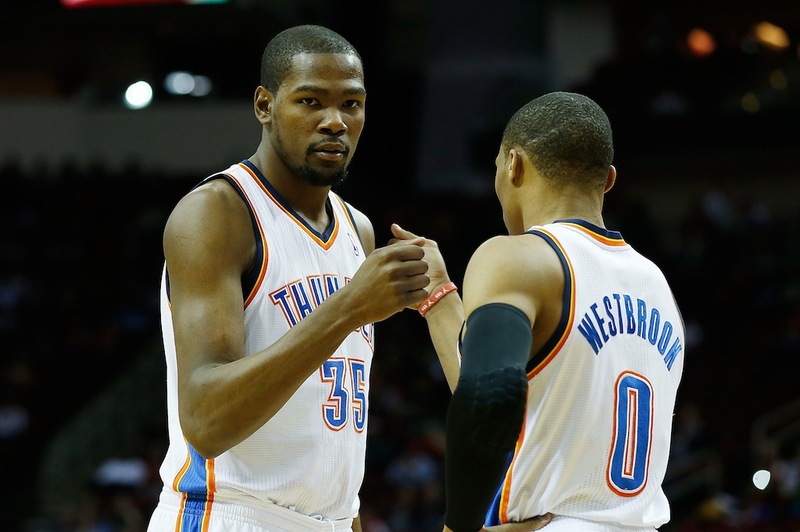 And we would remember an exchange between Kevin Durant and Russell Westbrook that nearly tore the roof off Chesapeake Energy Arena. On April 13, 2012, the Sacramento Kings traveled to Oklahoma City to take on the Thunder in an inconsequential regular-season game — or at least that’s what we thought until there were just over two-and-a-half minutes left in the second quarter. For it was at this point that Durant collected a loose ball off a Kings turnover and immediately went to work. KD used his crazy long strides to dribble the ball from the Thunder’s free-throw line to just inside the Kings’ three-point arc. From there, he simply lofted the rock toward the rim, where Russell Westbrook streaked into the picture, caught the ball with his right hand, and thundered it home.